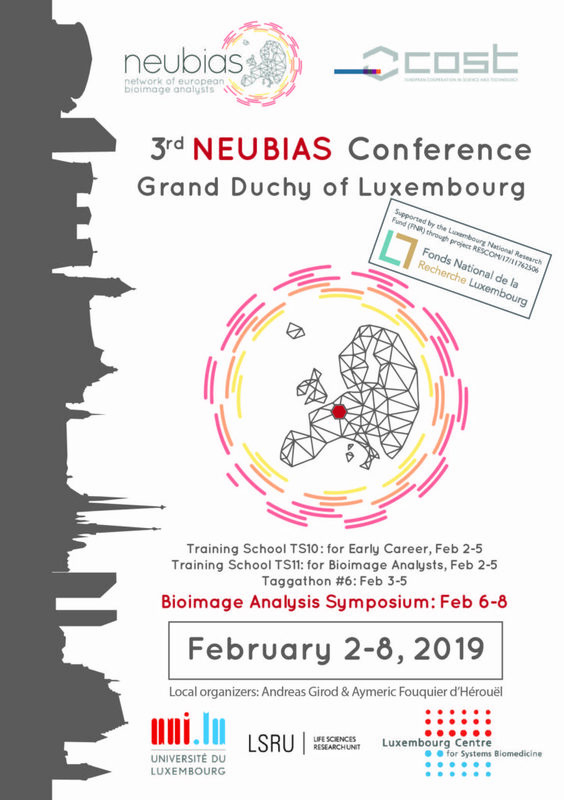 Andreas Girod and Aymeric Fouquier d’Hérouël will be hosting the conference in Luxembourg, which will include a Training School for Early Career Investigators, a Training School for Bioimage Analysts, a Taggathon to continue building the NEUBIAS online resources for the Bioimage Analysis Community. Moreover, the Bioimage Analysis Symposium will be organized from the 6th to the 8th of February, 2018, which will include a new Satellite workshop open for bioimage analysts on the 5th of February (afternoon). The symposium will highlight Keynote lectures from Susan Cox, Kevin Eliceiri, and Ivo Sbalzarini and will include talks from other 14 exciting invited speakers. Also, contributed talks will be selected from abstracts. The NEUBIAS symposium will feature signature sessions: the Call for Help or “image clinics” session (C4H), the Open source Software Lounge (OsSL), the Panel Discussions as well as company Workshops and Digital Posters.